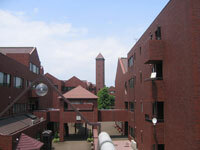 The first thing you notice about Bunkyo University's Shonan Campus is the red brick of its buildings. Here is an oasis of European ambiance in the deep greens of the surrounding countryside. Established in 1985, Shonan Campus is equidistant from Chigasaki and Shonandai Stations. The famous tourist attractions of the Shonan area-Chigasaki Southern Beach, Enoshima Island and Kamakura-are conveniently nearby. Behind the mellow walls, however, is a cutting edge institution of information technology. In its Media Building, Shonan Campus boasts one of the largest and most up-to-date multimedia information processing environments anywhere in Japan. For the students of the Faculty of Information and Communications,the Faculty of International Studies,the Faculty of Health and Nutrition and the Faculty of Business Administration, 900 personal computers are linked by giga-bit Ethernet (GigE). This allows the transfer of large volumes of information data to support students' multimedia content production and research activities. In addition, extensive television and radio studio facilities allow students hands-on experience in all aspects of practical media production. Even the educational, sports and student welfare facilities expected of a modern institute of higher learning go beyond the ordinary. The University Library holds over 200,000 volumes, and the Student Center offers a unique and exciting space for students to both relax and express themselves. The spacious tree-lined haven features a miniature version of Mount Fuji, and amphitheater steps that invite sitting and relaxing on warm, sunny days. Students mount lunchtime concerts here, and it is the main stage area for the fall cultural festival. Bright, comfortable study areas and almost a quarter of a million books add up to an ideal environment for research and study. In addition to the library's own extensive print and audiovisual collection, there is access to other university libraries throughout Japan. Reference staffs are on hand to offer assistance. Two "Shokudo"-style cafeterias offer varied menus throughout the day. Be sure to check out the bargain Japanese breakfast in the recently refurbished downstairs hall. When the sun shines, students enjoy eating and socializing on the outdoor terrace and upstairs balcony. Windows and Macintosh computers are provided for student use at all times, together with a General Information Service Desk. Personal computers with CG (Computer Graphic) and DTM (Desk Top Music System) software are used in courses and are also available for student use. Students can use this soundproof space for digital music production, including live performances and voice recording. The large and well-equipped facility allows practical training in all aspects of film and television planning, rehearsal, shooting and post-production. This multipurpose facility adds to student life in a variety of ways. You'll find a cafe, general store and exhibition area (first floor), event space (second floor), club offices including the campus radio station (third floor), soundproof band practice studios (fourth floor), and a Japanese archery range on the roof.